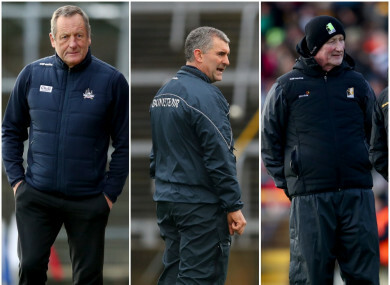 John Meyler, Liam Sheedy and Brian Cody take their sides into action on Sunday. CORK AND TIPPERARY have made four changes apiece before they face off on Sunday afternoon in Division 1A of the Allianz hurling league. Cork draft Anthony Nash into goal, hand starting places in defence to Darren Browne and Damien Cahalane, while naming Jack O’Connor in attack at corner-forward. Patrick Collins, Sean O’Donoghue, Robert Downey and Daniel Kearney are the players to make way from the side that defeated Limerick last Sunday. In the Tipperary defence Cathal Barrett and Joe O’Dwyer come in on the right flank while Jake Morris is introduced at right half-forward and John McGrath gets the nod to start at left corner-forward. Alan Flynn, Seamus Kennedy, Patrick Maher and Willie Connors are the players to make way. Kilkenny manager Brian Cody has kept faith with the side that saw off Tipperary last Sunday thanks to a last-gasp pointed free from goalkeeper Eoin Murphy. They are unchanged for Sunday’s clash with Wexford. Email “Cork and Tipperary both make 4 switches as Kilkenny stay unchanged”. Feedback on “Cork and Tipperary both make 4 switches as Kilkenny stay unchanged”.